A festive cheese ball recipe made with goat cheese or cream cheese, white cheddar, pecans and cranberries. My Canadians are in town. Well, not all of them but enough to keep my kitchen hopping! Which makes me happy, happy, happy! I love an excuse to camp out in the kitchen! We were heading over to my brother-in-law’s this weekend and, not wanting to show up empty-handed, I decided to try out a new idea for Christmas! I’d seen the recipe for these Cheese Ball Pops from Cooking on the Side and thought it seemed like a great idea for a cheese ball! Now, I made mine with goat cheese because I love it but if you’re not a fan, you could absolutely substitute cream cheese for a milder taste. As far as cheese goes, I like it when it bites back a little so me and goat cheese are old friends. The twangy cheese mixture goes perfectly with the sweet cranberries and woody pecans and the whole thing just looks like Christmas on a plate! The green rosemary sprigs and red cranberries make for a very festive display and would be the star of any holiday party cheese board! 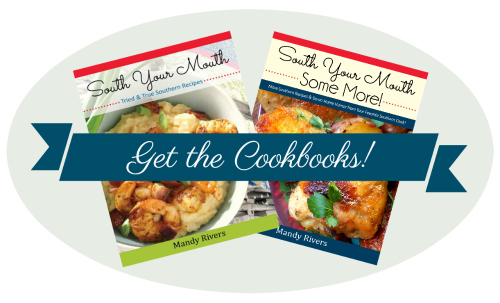 If you're looking for more fun appetizers, try some of these recipes too! Party Shrimp – Super easy shrimp appetizer recipe with just a few ingredients that cooks up quick in the oven. Buffalo Feathers – Grilled chicken tenders sauced like wings for all the fun and flavor of buffalo wings with half the work! Monte Cristo Party Sliders – Party sandwiches made with ham, turkey and cheese baked in a rich buttery topping dusted with powdered sugar. Chipotle Shrimp Tostada Bites – Mini tostadas with chipotle glazed shrimp and guacamole sprinkled with a confetti of red onion and cilantro! Original Sausage Balls – The original recipe for sausage balls using Bisquick, cheddar cheese and sausage. Ham & Swiss Party Pinwheels – A super easy appetizer recipe using puff pastry, ham and cheese that's perfect for entertaining. Mix goat cheese or cream cheese with an electric mixer until smooth. Add cheddar, milk, salt and pecans then continue mixing until well combined. Line a small round bowl with plastic wrap then spoon cheese mixture into bowl. Press cheese firmly into bowl. Bring plastic up and over the top of cheese and gather to shape cheese into a ball. Seal ball with more plastic if necessary to completely cover then refrigerate for at least 4 hours. It’s OK if it’s kinda wonky at this point. Once it firms up you will be able to easily shape it into a perfect ball. When ready to serve, arrange rosemary sprigs on a serving plate (I arranged mine like a wreath); set aside. Pour cranberries into a pie plate and separate any that might have stuck together; set aside. Remove cheese ball (in plastic) from the bowl. Keeping cheese ball wrapped in the plastic, use hands to shape into a ball. 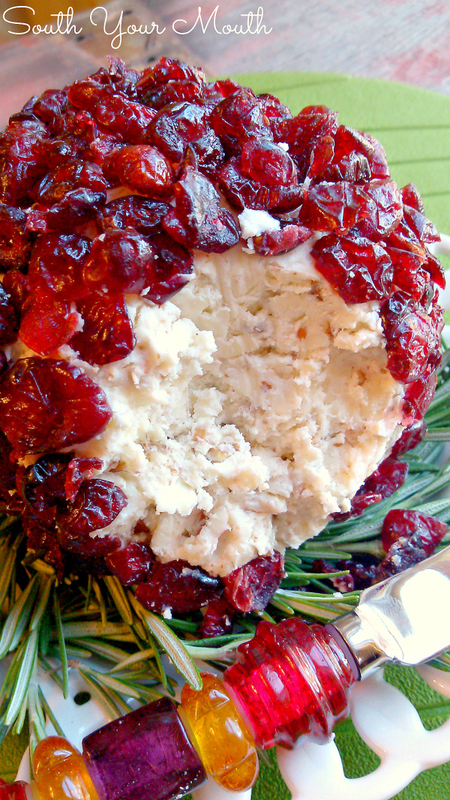 When the cheese ball is perfectly round, roll in cranberries then set on rosemary sprigs. 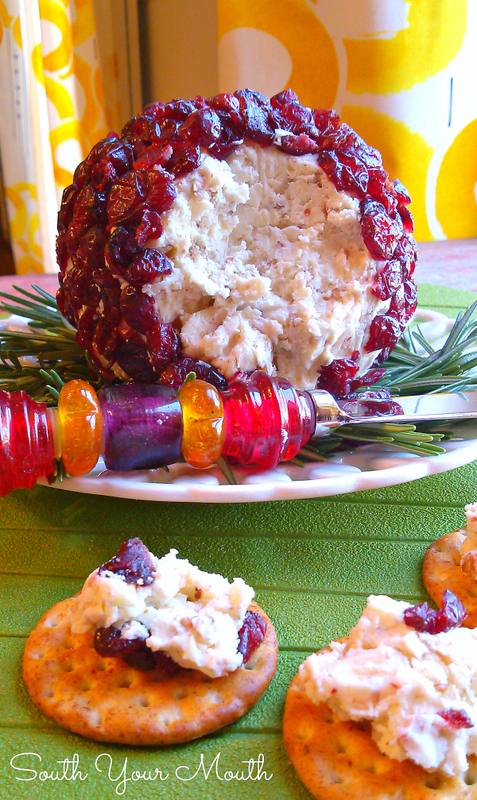 All of the cranberries won’t stick when you roll the cheese ball in them. That’s OK. Just piece them on until the cheese ball is nicely covered. This recipe was shared at the Weekend Potluck and Meal Plan Monday! Hi Mandy, Sorry about the comment, this is not the receipe I was making the comment about. BUT---- as long as I am here, This receipe sounds amazing, but, I would have to go with the cream cheese. Owned a goat once upon a time, long long ago, and I can't get the cheese to my lips past the goat smell!! Sorry. But I love cream cheese, and I am going to try this receipe. Happy Holidays' Everyone !!!!!!!!!!!!! Haha, I understand. There's a reason I don't eat BBQ hash so I can relate! Thank you! This was so easy and so delicious! Looks fabulous cannot wait to make it. So I have bought everything to make this for Christmas Day....Lets hope it is a success!! I am doing the cream cheese to be safe tho...lol Thank you for the recipe !! You could add some cinnamon into the mix & also with the craisins on outside. My favorite big box store ( Co...o) has something similar with goat cheese & it's divine. I make my own chucky fresh cranberry sauce with nuts. I'm going top my cheese ball with my sauce. I bought my ingredients today. I'm going to mix 4oz cream cheese with 4 oz of goat cheese. I love the twang of Goat cheese, but want to balance it out a bit. Looking forward to having this for Christmas day! Think I can skip the cheddar cheese? Sure! It might not hold its shape as well though.